This is a perfect project for Summer or Fairtrade Fortnight (Feb/March each year) plus it’s a great way to support Oxfam’s GROW campaign for a fairer world where everyone has enough to eat. Tomato Jam: Inspired by a recipe our founder, Sarah Corbett, received from a lady in Kenya, this project involves making tomato jam, stitching a fabric lid cover with a message in support of Oxfam’s Grow campaign, and using it as a way to speak to people about the world’s unfair food system. 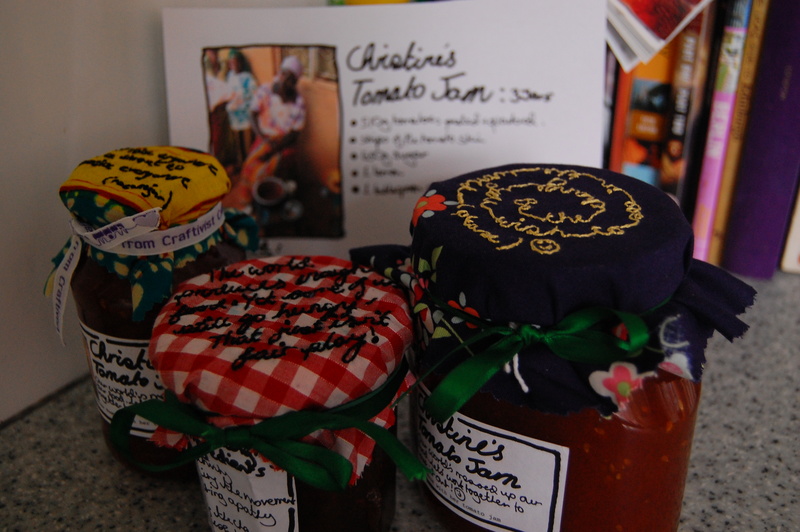 The craftivism jam project was inspired by a Kenyan woman called Christine who gave Corbett the tomato jam recipe when Sarah was visiting Christian Aid partners and beneficiaries in 2006. She was part of a women’s cooperative in a semi-rural suburb just outside Nairobi, which had lost a generation to HIV AIDS. There were loads of isolated older women living on their own looking after orphaned children. They had lost their husbands or sisters, like Christine, or they were looking after orphaned grandchildren or taking in kids just wondering the streets they couldn’t really afford. A local charity (BIDDII supported by Christian Aid) encouraged these women to get to know each other and support each other. It was a big community boost, a proper support network. 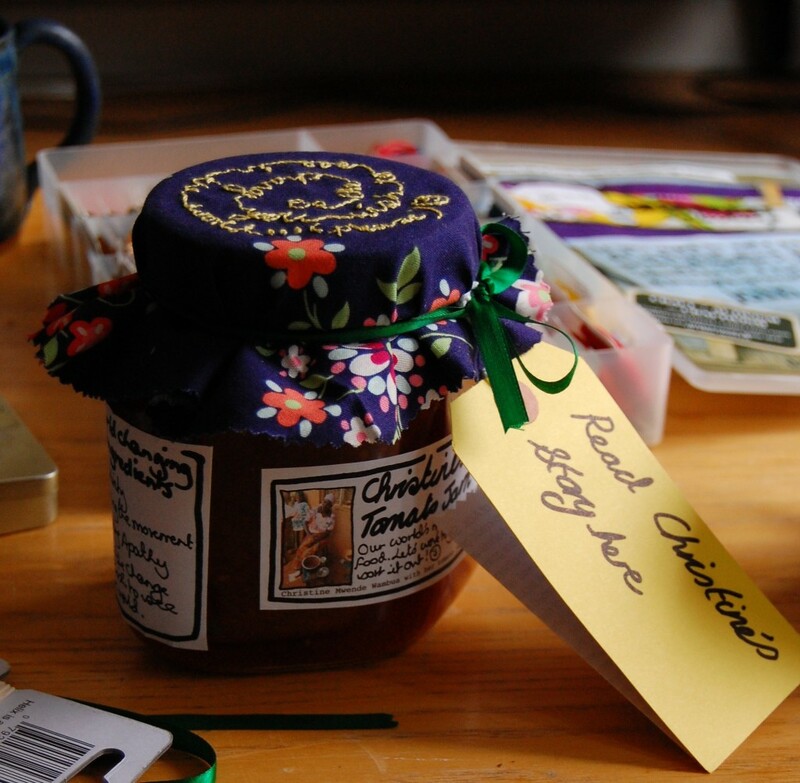 The women had all been doing these things separately to make ends meet but not they could share skills and be in solidarity with each other- Christine had her tomato jam, another woman tie-dyed clothes, another woman made soap. They shared all these clever tricks and others like growing bananas in ditches to hold in water and how to work with tomatoes and pumpkins because they’re more drought resistant. They all supported each other by pooling their resources and bought uniforms to send the children to the local school. It was free, but you needed a uniform to get in. Sarah met Christine for ten minutes and even though they used an interpreter, Sarah was moved by Christine’s story and passion to keep fighting for a better world. 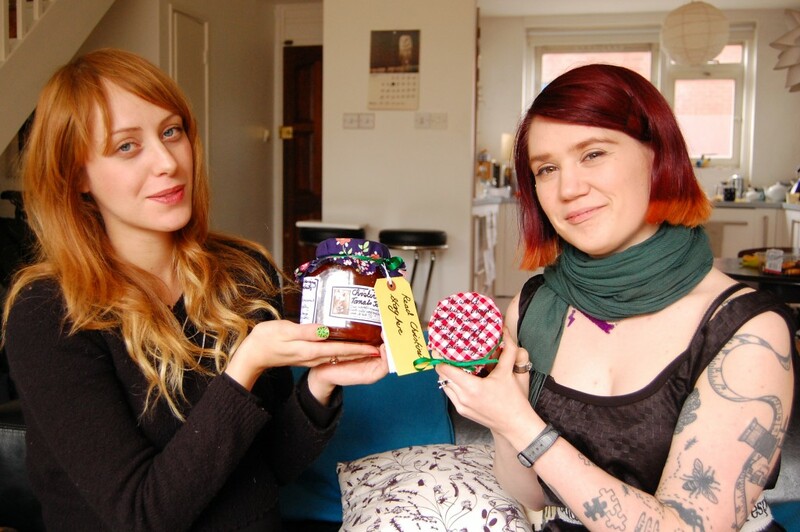 The fabulous Brixton W.I support this project have held a Craftivist workshop on jam lid as well as fellow W.I group the Shoreditch Sisters. We’d also love it if more Women’s Institute groups around the U.K wanted to get involved and other groups around the world. 5 cups peeled and quartered tomatoes. Method: Put tomatoes, sugar and sliced lemon in large, heavy pot and bring to slow boil over medium- high heat, stirring occasionally. When foam rises to surface, add butter and continue stirring and simmering until preserves thicken, about 45 minutes. 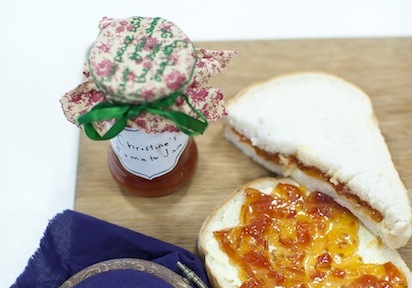 (To test, stick a fork into preserves. When preserves cling to tines of fork, it should be thick enough to can). Pour preserves into sterilized jars, seal and process in hot water bath for 15 minutes. We hope that you’re inspired by this project to do your own craft sessions, jam making sessions but most of all we hope you’re inspired to use your skills, passionates and talents to make our world a better place for all, especially the most vulnerable people in the world.